There was no shadow flicker to experience, due to the generally cloudy conditions at Forward as well as the time of day. There was no missing the visual impact of the Forward project looking south from where we gathered, which was in front of Larry’s hangar. There were easily 50 turbines viewable from that vantage point. Moreover, off in the eastern horizon, the Cedar Ridge turbines were plainly visible, although their visual impact was slight compared to the panorama of Forward turbines from east to west. 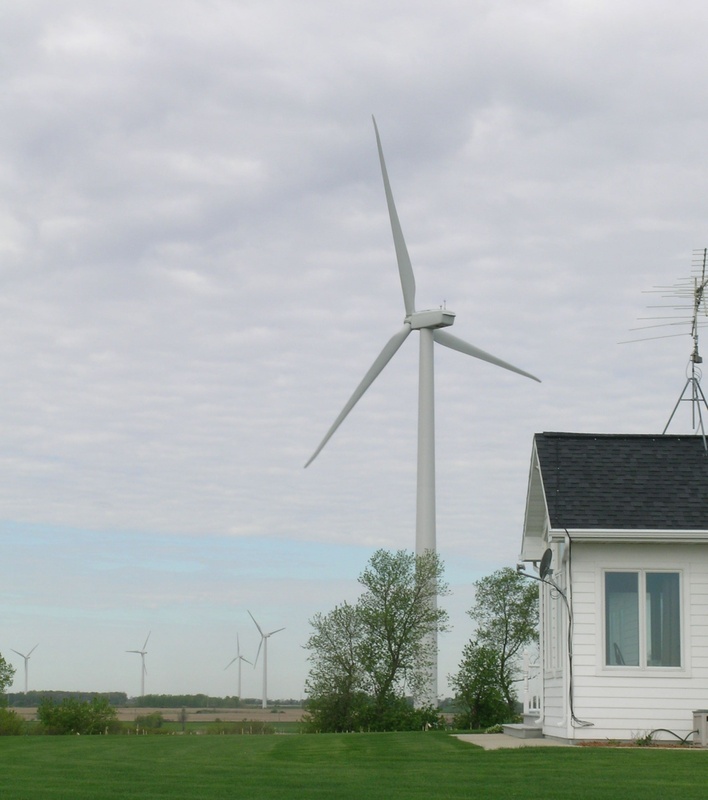 Since he owned the property before the wind turbines were constructed, the change in his south-facing viewshed must have been dramatic, to say the least. No one had any difficulty hearing Larry or any other speaker during the tour stop. Maybe others were able to perceive sound coming from the turbines, but I certainly wasn’t. We were able to make out a plethora of other sounds while we were there, including a very loud plane flying overhead, occasional bird chatter, random mooing of cows and, at one point, a helicopter buzzing over the turbines. The bucolic sounds of the countryside were in no way disturbed or distorted by whooshing noise. . . .
After the presentations were concluded, the group walked to the turbine closest to the operations center. As we approached the turbine we spotted two red-tailed hawks wheeling above the turbine, looking not the least bit alarmed. The wind started to pick up then. The turbine door was opened and a few Council members and PSC staff stepped inside. Others gathered about 200 feet from the turbine to talk. Even though everyone was quite conscious of the whooshing blades (and an audible chirping sound with each revolution), we were able to converse with each other without having to raise our voices or cup our ears. Not far away, one of the Council members, a wind opponent, was listening to messages on his mobile. No one, including the opponents, seemed troubled by our proximity to the turbine. Given how quick they are to misrepresent the contents of the Vestas safety manual, they seemed not at all worried about what harm might befall them being only 200 feet from a spinning industrial monster. The two WINDCOWS representatives were tagging along and they didn’t seem the least bit fazed either.